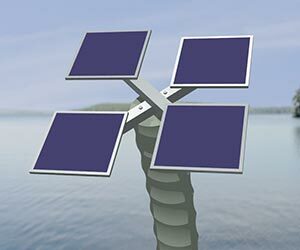 The Helio™ solar tracker is a floating support for solar collectors to improve their efficiency. The passive Helio follows the sun, like a heliotrope or sunflower, and draws no energy from the solar cell mounted to it. The Helio is a coil spring covered with a water absorbent material. During the night, capillary action draws water up the surface of the tube, expanding the covering slightly. In the morning the sunlight dries one side causing that side to shrink. When a photovoltaic cell is mounted to the top surface, its efficiency is optimized during the tracking period. A cluster of Helio solar trackers can be wired together to supply the needs of a house or village. Helio tubes are slid onto flotation base and secured with a hose clamp. Flat solar cells attached to the top mounting surface, spaced apart to let sun reach the support tube. Lesson learned from nature. Fresnel lens to concentrate sunlight and improve efficiency. Fiber-optic bundle can replace solar cell to pipe light into a building. 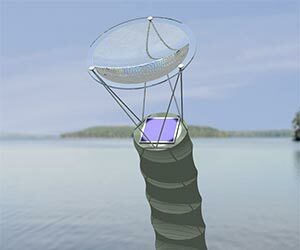 On a pond, a pole is inserted through a hole in the base and supported with a float (shown in white). A weight at the bottom of the pole keeps the bottom down. The Helio can be supported with stacked spacers, which can tip at an angle relative to the one below it. Shown on top is a small solar cell and air-spaced Fresnel lens. An electrical wire is routed from the solar cell through wire-access holes in each spacer and out the bottom. A, Stationary solar cell with no tracking, the equivalent of solar panels on a roof. B, The Helio solar tracker keeps the solar cell perpendicular to the sun during the tracking period. The Helio is ideal for remote locations such as forest ranger towers which must have electrical power for radio communication and signal lights. Helio trackeres are mounted in a roof-top trough which catches rain water and keeps the Helio trackers wet. The Helio™ is based on simple technology and which requires little or no maintenance, making it ideal for third-world countries. A Helio farm can be set up across any wet surface, such as a pond, rice paddy or building roof. If the water supply dries up, the Helio stands vertically. When it rains, the Helio resumes operation.